Prepare a syrup by simmering candy, sugar and water in a small saucepan until sugar and candy are completely dissolved. Let cool to room temperature. Place plum halves and syrup in a large resealable plastic bag; let marinate for 1/2 hour. Remove plums from bag and drain well. Pat dry with paper towels, then coat with non-stick cooking spray. Grill over medium heat, cut side down, until well-marked and nearly tender. Turn and grill over indirect heat until fruit is tender; set aside. To prepare crumble, preheat oven to 400 degrees F and lightly butter 4 individual baking dishes. Toss plum slices with 1/4 cup sugar and let stand for 15 minutes. Transfer to prepared dishes and set aside. Stir together remaining 1 cup sugar with flour, oats and cloves, then stir in melted butter; sprinkle over plums. Bake for 30 to 40 minutes or until top is golden brown. 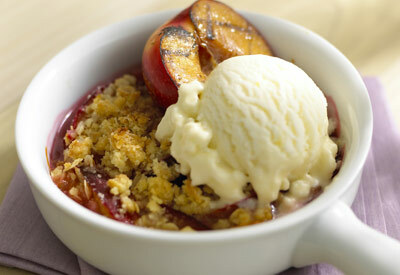 To serve, place grilled plum halves onto crumbles and top with vanilla ice cream. Garnish with mint, if desired.